The Annex in Llanwrda, near Llandovery, Carmarthenshire sleeps 2 people. 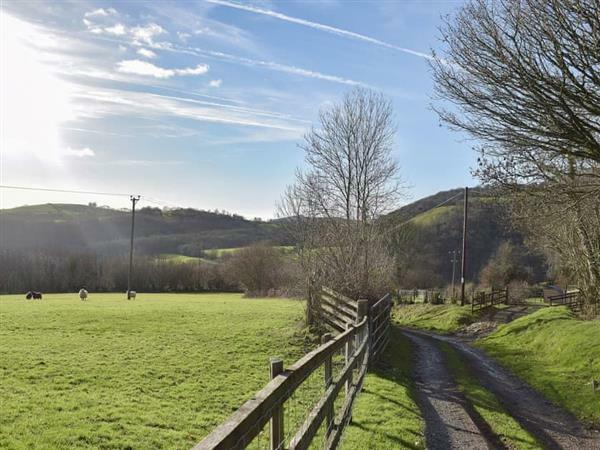 The Annex near Llandovery is nestled within the rolling Carmarthenshire countryside and is sat high within the hills with breathtaking, picture postcard views out across the wooded valley below towards the Black Mountains of the Brecon Beacons National Park. Set along a farm track, meandering for around a mile up through the green meadows and luscious countryside, and as you reach the top you can take in the breathtaking views. The Annex is attached to the owners’ home and completely private within this wonderful small holding, and complete with two resident goats! This lovely property has been thoughtfully furnished throughout and offers open plan living/dining/kitchen area with commanding views over the garden and the mountains beyond. The bedroom has been lovingly decorated and offers an en-suite shower room. Enjoy the use of your garden on those balmy summer days with a glass of wine and a good book. The quaint hamlet of Llanwrda is only 5 minutes’ drive away and the historic market town of Llandovery is only 15 minutes’ drive. Here you can step back in time at Llandovery Castle, enjoy some home cooking and locally brewed ale, or take a stroll around the town. It makes The Annex a perfect central location from which to explore this beautiful part of Carmarthenshire. A great day out locally is to the Brecon Beacons National Park which includes one of Wales’ highest mountains, Pen-y-Fan, where you can discover a host of wildlife, some fantastic walks for all abilities and mountain biking. The Dolaucothi Gold Mines are also really worth a visit and are managed by the National Trust. The shop is 1½ miles from The Annex near Llandovery, with the pub and restaurant 3 miles from The Annex. Living area: With 28’’ Freeview TV, DVD player and CD player. Kitchen area: Galley style with induction hob, combi microwave/oven/grill, fridge/freezer and tiled floor. Oil central heating, electricity, bed linen, towels and Wi-Fi included. Travel cot available on request. Welcome pack. Use of owners’ washing machine. Lawned garden with sitting-out area, garden furniture, barbeque and fire pit. 12-acre natural grounds (shared with owner). Private parking for 1 car. No smoking. Please note: No children except babes in arms. Holidays at The Annex run from Friday to Friday. For a better idea of where The Annex is, you can see The Annex on the map below. The Annex is in Dyfed; should you be on the lookout for a special offer, you can find all the special offers in Dyfed. It's always worth checking to see what is on offer at the moment. Do you want to holiday near The Annex (UK10613), you can see other cottages within 25 miles of The Annex; have a look to find your perfect holiday location.